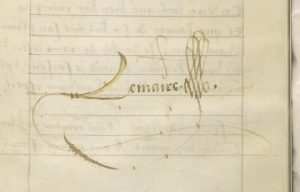 Lehigh University’s small but excellent collection of Medieval and Renaissance manuscripts deserves to be better known–and soon will be thanks to the Bibliotheca Philadelphiensis digitization project! Only the first sixteen of the university’s manuscripts to be acquired were described (and briefly at that) in Seymour de Ricci’s Census of medieval and renaissance manuscripts in the United States and Canada (1935–1940); later acquisitions were not listed in the supplement to the census published in 1962. In 1970, the young John C. Hirsh (now a professor of English at Georgetown University), who received his doctorate from Lehigh that very year, organized an exhibition of the manuscripts and published a short guidebook to them, which was the first attempt at a complete checklist: Western Manuscripts of the Twelfth through the Sixteenth Centuries in Lehigh University Libraries: A Guide to the Exhibition. The 1970 exhibition provided some new information about Lehigh’s manuscripts, but nothing like a comprehensive catalog, and there remains much research to be done on this collection. A case in point is Lehigh Codex 19, a Book of Hours of the Use of Rome described by Hirsh as a “15th-century manuscript on vellum, written in France.” A closer examination of the manuscript in fact reveals that it was produced in Flanders for export to Spain, a phenomenon that was quite widespread in the fifteenth and early-sixteenth centuries (and another example of which may be the famous Collins Hours at the Philadelphia Museum of Art). 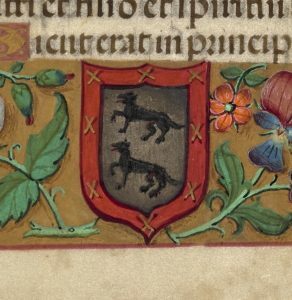 To begin with, the coat-of-arms visible on fol. 3r, nestled amidst a charming “Ghent-Bruges”-style border more typical of Flanders in the early sixteenth century, is identifiable as that of the Ayala family of Toledo, Spain: Argent, two wolves passant sable in pale, a bordure gules charged with eight saltires or (in Spanish, “En campo de plata, dos lobos de sable, uno sobre otro; bordura de gules, con ocho aspas de oro”). The Ayala de Toldeo family was prominent in royal affairs in Spain around the turn of the sixteenth century, having been awarded the Duchy of Fuensalida by Henry IV of Castile in 1470. While the book contains no further information as to the exact original owner of the book, an examination of the Ayala dynasty allows us to posit a number of potential candidates, either among the sons and daughters of Pedro López de Ayala II, whose death in 1486 probably occurred before the book was made, or among the children of Alfonso de Silva y Ayala, perhaps Pedro López de Ayala IV, who died in 1537. The imposing Ayala residence in Toledo, the Palacio de Fuensalida, survives today as the headquarters of the presidency of Castilla-La Mancha. The building’s interior and facade are emblazoned with the coat-of-arms found in our Book of Hours. Other evidence of our manuscript’s intended use and eventual presence in Spain abounds. The manuscript contains Castilian rubrics for a series of fifteen unusual prayers that appear to be associated with Giles of Rome (lived ca. 1243–1316; fols. 109r-181v), and an inquisition verification inscription on fol. 181v, dated to 1573. 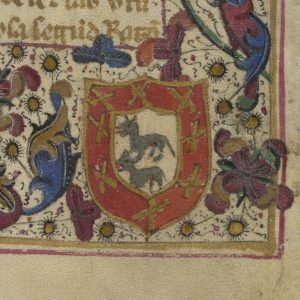 By coincidence, another manuscripts preserved in the region, at The Rosenbach Library and Museum, also contains a (previously identified) coat-of-arms of this same family. Rosenbach MS 482/2, a Spanish translation of De regimine principum produced around the year 1500, includes the Ayala de Toldeo arms in the bottom right hand corner of folio 18r. 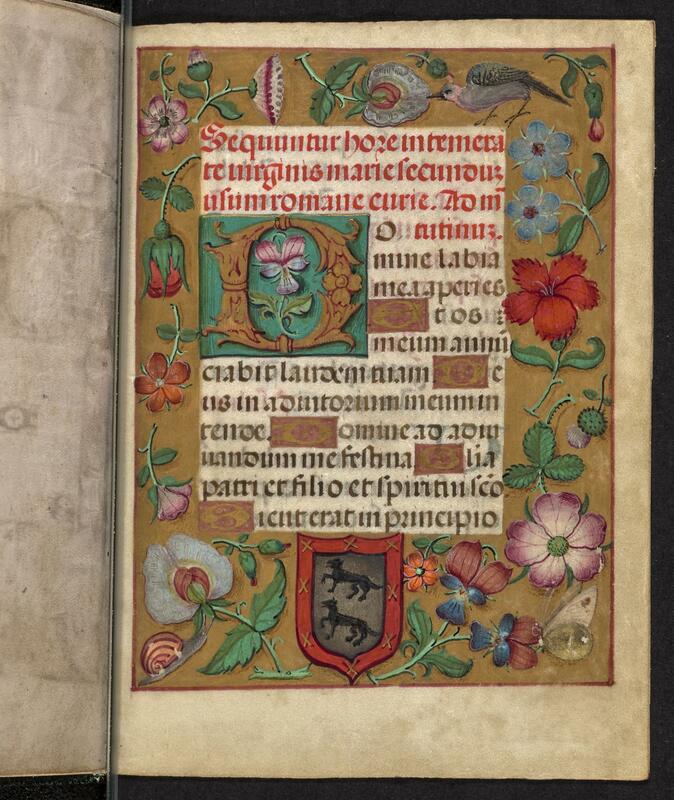 Interestingly, this treatise on the conduct of princes was originally written by Giles of Rome, the author to whom some of the prayers in the Lehigh Book of Hours seem to be connected. Might there be an Ayala family preference at play here? For this phenomenon see Javier Docampo Capilla, “Horas Scriptas / Horas de Enprenta: Producción y Comercio de Libros de Horas En La Península Ibérica,” in Del Autor Al Lector: El Comercio y Distribución Del Libro Medieval y Moderno, ed. Manuel José Pedraza Gracia, Carlos Yolanda San Román, and Nicolás Bas Martín (Zaragoza: Prensas de la Universidad de Zaragoza, 2017), 15–36; and idem, “La importación de manuscritos iluminados y su influencia en la miniatura de la Península Ibérica: 1470-1570,” in La miniatura medieval en la Península Ibérica, ed. Joaquin Yarza Luaces (Murcia: Nausicaa, 2007), 255–311. For this family, see Juan Ramon Palencia Herrejón, “Elementos Simbólicos de Poder de la Nobleza urbana en Castilla: los Ayala de Toledo al final del Medievo,” En la España medieval 18 (1995): 163–180; and idem, Los Ayala de Toledo: desarrollo e instrumentos de poder de un linaje nobiliario en el siglo XV (Toledo: Concejalía de Cultura, 1996). Our series begins auspiciously with a long-lost royal prognostication on the good fortune of the year to come, the Pronosticque historial de la félicité future de l’an mil cincq cens et douze, or, translated roughly into English, the Exemplified foretelling of the future joy of the year fifteen-hundred-and-twelve. This sixteen-folio manuscript, written and signed by the important Walloon poet and historiographer Jean Lemaire de Belges (c. 1473–c. 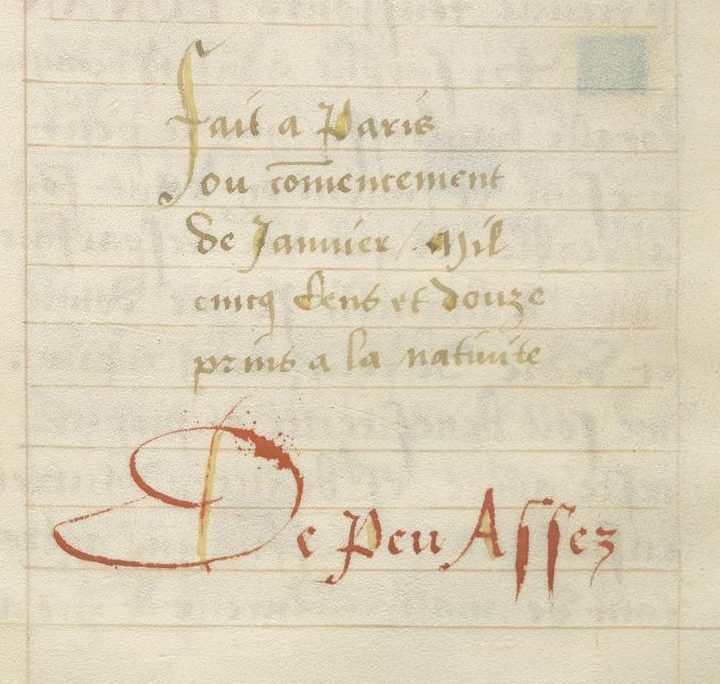 1525), is an autograph copy produced for the Queen of France, Anne of Brittany (1477–1514). The text is otherwise unknown, and its rediscovery in the collections of The Rosenbach Museum and Library makes for an important addition to the author’s corpus while providing new information about the literary leanings of its famed recipient. Anne, to whom the work is dedicated, was an extraordinary political leader and a great patroness of the arts. She has the distinction of being the only French sovereign to have been twice crowned, first as the wife of King Charles VIII and then, after his sudden death in 1498, as the consort of Charles’ successor and second cousin once removed, Louis XII. Philadelphia in fact preserves numerous manuscript artifacts related to Anne and her husbands: the Free Library of Philadelphia houses the beautiful February, June, August, and September calendar pages from a grand Book of Hours made by the court painter Jean Bourdichon for Louis XII in 1498, while a single leaf fragment with a miniature of the Lamentation by Jean Poyer includes, on its reverse side, an inscription identified by Roger Wieck as possibly being in Anne’s own hand. 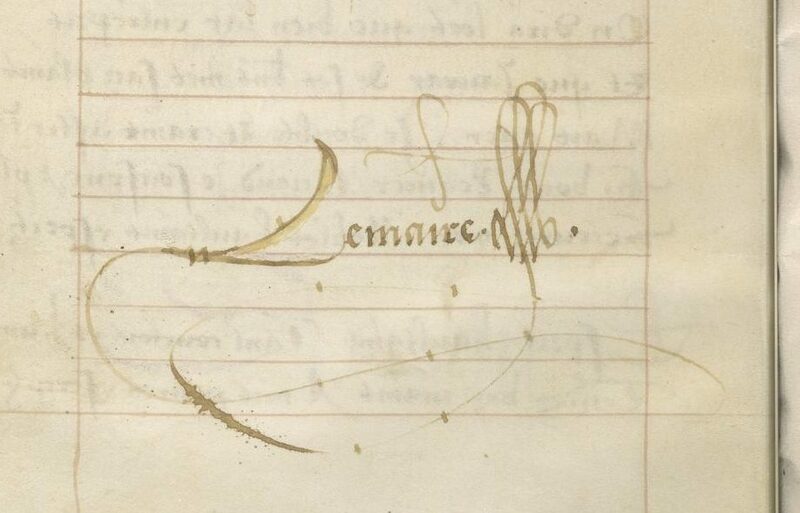 The FLP also houses a manuscript with an unusual binding decorated with the ermine tail, one of Anne’s emblems, and a (previously unnoticed) fragment from the once-impressive choirbooks commissioned by Anne and Louis, bearing their initials and emblems. Anne’s library has been the subject of some excellent recent scholarship, and this new find helps to enrich our knowledge even further. As mentioned above, the present manuscript is the sole surviving exemplar of an unpublished text apparently unknown to specialists. Its most detailed prior mention occurs in the Report of the Royal Commission on Historical Manuscripts of 1876, when it was in the collection of Evelyn Philip Shirley (1812-1882) of Ettington Hall, Warwickshire (where, incidentally, scenes from the 1963 film The Haunting were filmed). It was presumably Shirley who brought the manuscript to the British Museum to have it inspected by Keeper of Manuscripts John Holmes (1800-1854), whose handwritten notes are found in the front flyleaves of the manuscript. Previously, it had been in the collection of Walter Henry Bracebridge (d. 1832). It is not immediately clear how the manuscript ended up with A.S.W. Rosenbach in Philadelphia. Despite being present in prominent collections, the book has escaped mention in the voluminous literature dedicated to Lemaire de Belges, being noted briefly only in Paul Oskar Kristeller’s Iter Italicum. As such, I am currently at work on a critical edition of the short text, to be published in the not-too-distant future. But what does this unusual text actually say? As a prominent court poet, Lemaire de Belges was renowned for creating “poésies de circonstance” or short works intended to address a particular situation. In this case, he addressed the auspicious numerological circumstances of the year 1512. The first page opening includes the queen’s Castilian motto “NON MUDERA” inherited from her Spanish mother (and also seen below, on the right, in the most splendid book she owned, the Grandes Heures d’Anne de Bretagne), as well as the year in Roman numerals. These insriptions are contained in two red banderoles, which frame a star-like emblem with a cypher containing the letters of ANNA BONA (good Anne/good year). Lemaire de Belges and his contemporaries were fond of word play, complex rhymes, and clever layouts. In fact, another manuscript in Philadelphia, quite damaged and certainly not an autograph copy by its author, contains a similarly virtuoso device in praise of Queen Anne. 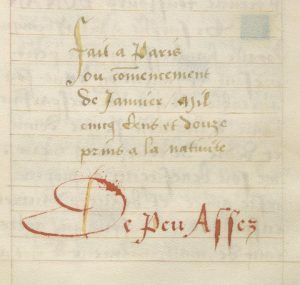 The University of Pennsylvania’s partial copy of Le vray-disant, advocate des dames (UPenn Ms. Codex 956), written in the same years by Lemaire de Belges’ contemporary Jean Marot, includes a “Ballade de la Paragonne des Dames” in which the letters at the start of each line spell the Queen’s name and title: ANNE DE BRETAIGNE, ROYNE DE FRANCE. This kind of acrostic device was especially popular with the French rhétoriqueurs of the early sixteenth century. Can you spot this example of word-play in the images below? See Roger S. Wieck, “The Artist Jean Poyet and His Oeuvre,” in The Hours of Henry VIII: A Renaissance Masterpiece by Jean Poyet, ed. Roger S. Wieck, William M. Voelkle, and K. Michelle Hearne (New York: George Braziller, 2000), 27–29. For an otherwise comprehensive list of known fragments, see Christopher De Hamel, Gilding the Lilly: A Hundred Medieval and Illuminated Manuscripts in the Lilly Library (Bloomington: Lilly Library, 2010), no.83, 183. Cynthia J. Brown, ed., The Cultural and Political Legacy of Anne de Bretagne: Negotiating Convention in Books and Documents (Cambridge: D.S. Brewer, 2010); Cynthia J. Brown, The Queen’s Library: Image-Making at the Court of Anne of Brittany, 1477-1514 (Philadelphia: University of Pennsylvania Press, 2010).